Mortgage interest rates that hit historical lows this past year are unlikely to inch back up to much more than 6% by the end of 2010. Though, according to real estate industry experts, this month's affordable 5% will be hard to maintain for too much longer as the U.S. economy continues its gradual recovery. "Despite the Federal Reserve's retreat from purchasing mortgage-backed securities last month, rates have been kept down due to private investors filling the void," says Resident Real Estate Pro - Southern Sonoma Country Life's (Sponsor) Timo Rivetti. "The country's elevated budget deficit coupled with a recovering economy have helped to keep interest rates down for an extended period of time," says Rivetti, who believes that continual growth within the U.S. economy will most likely bring interest rates up to the 6% mark by the end of this year. "With a massive slowing down of home price inflation across the country, I would not expect to see the demand for credit pushing up interest rates to any higher than 7% in the next couple of years," says Rivetti. "Here in Sonoma County prices have stabilized in the starter home and mid-size home market and agents are seeing a return of the multiple offer scenario on appropriately priced properties. If you are considering buying a home in the region within the next 12 months, now is the time to take advantage of those rock-bottom interest rates." Rivetti recommends pre-approval for a mortgage loan before a client dips his or her feet into the current market. "Non-contingent real estate buyers stand the best chance of snapping up a competitively priced home," he says. "Savvy buyers know that this climate of affordability won't last forever." "Also please understand that the lender's underwriter is the most critical person in the real estate transaction today. Without the 'underwriters' approval NO LOAN gets approved. That is why today's buyer needs a local lender that has a PROVEN track record and an experienced agent to guide through the escrow". 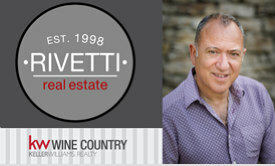 Petaluma's People's Choice Best Realtor for 2009, Rivetti transitioned to Keller Williams' new International Real Estate brokerage as a launching partner at 1383 N McDowell Blvd, Petaluma, CA 94952 from downtown REMAX Marina Realty this Spring. Though still in the process of a full web site conversion, Southern Sonoma Country Life posts appear on the top broker associate's site daily, offering home buyers and sellers a colorful slice of SoCo Living at its best!